Into a mixing bowl take maida, semolina, salt and ghee and mix well till mixture is crumbly. Add water (75ml) slowly and make sticky dough. Add oil and smoothen the dough and cover the bowl and rest dough for one hour. Take a bowl and add grated jaggery and water (100gms-1/2cup) and heat it. Stir the jaggery mixture till it dissolves completely in the water. Strain the jaggery mixture through a fine mesh to remove any impurities. Heat the jaggery mixture on high flame stirring occasionally till the mixture is thick and foamy. Reduce flame to medium and cook stirring till syrup reaches 122oC on candy thermometer (that is between hard ball stage and soft ball stage). Check the consistency of the syrup by dropping a portion in water and observe---the syrup should form a ball and if the ball is thrown from a distance into a plate it should make sound indicating that it is slightly hard. Switch off the flame and add the cardamom powder and mix. Then add the grated coconut and cooked dal powder and mix well to form soft dough. Spread the dal mixture into a plate and cool. Make balls of the filling dough and make equal number of balls with the covering dough. Covering ball size should be half of the filling ball size. Heat an iron griddle on low flame. Take a parchment paper and smear it with oil. Place a covering ball and press to flatten and form a small flat disc. Place a filling ball in the centre of the covering flattened disc and bring edges together to form a dumpling. Place the ball with seam side down on the parchment paper and start to flatten it with oiled fingers---apply oil in between for easy flattening. See that the disc is flattened in even thickness. Flatten the disc as thinly as possible as maida shrinks and bobbattu appears thick once placed on hot griddle. Now hold the parchment paper on which the disc is flattened and invert it on the hot griddle and wait for few seconds. Lightly pressing on the parchment paper, slowly lift the paper leaving the disc on the griddle. Roast the bobbattu on low flame only. 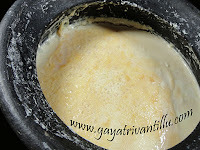 After few seconds, flip the bobbattu using a flat ladle. 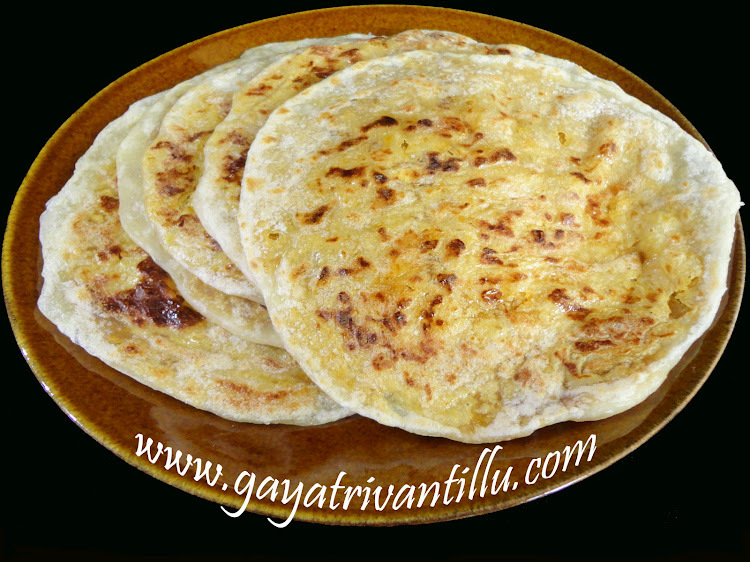 Fry the bobbattu on both sides till light brown spots appear on it and it is fully roasted without any rawness in it. Once done, take the bobbattu on to a serving plate and spread some ghee on both sides and serve hot. 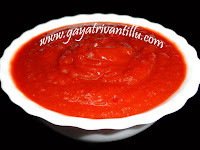 Similarly make the remaining bobbatlu and serve hot with ghee. Bobbatlu are traditionally made using maida. But health conscious people also make them with wheat flour and less oil. Adding a pinch of salt enhances the taste of bobbatlu. Bobbatlu are made using jaggery. However if jaggery is not available, use sugar---but jaggery bobbatlu tastes better. While making portions of covering and filling, covering ball should be half the size of filling ball. As maida is easy to stretch, half quantity of covering is sufficient to cover a filling ball. Also if the covering is too thick, it would be difficult to break the bobbatlu (PEEKKOVALASI VASTUNDI). On cooling, maida roti would become hard unlike wheat flour rotis. So the covering should be just sufficient to coat the stuffing. While making bobbatlu observe that the pressed bobbattu appears dark in color (filling color) with a very very thin layer of covering on the stuffing. After roasting observe that bobbattu is soft to break as maida covering is just coated as a thin layer on the stuffing---so babbatlu would be soft. Serve the bobbatlu smeared with hot ghee. Ghee adds additional flavor to the flavorful bobbattu. Do not make more bobbatlu as they do not have much shelf life. As bengal gram and grated coconut are used in stuffing, they get spoiled soon. Even if they are stored in refrigerator, as maida is used as a covering, it would be difficult to eat them. So make in small batches and enjoy as and when desired as all the ingredients used are common things in our kitchens and would be available easily. Another option is to make stuffing and keep a portion of it in refrigerator and make use of it next day with fresh covering dough---but fresh is always tasty than leftovers. Warm the bobbatlu in a closed container in microwave oven for 7 to 10 seconds and serve hot with ghee.